HomeCelebsPriyanka Chopra and Nick Jonas make one stylish public appearance! Priyanka Chopra and Nick Jonas make one stylish public appearance! The couple kept it looking sharp with their looks for the night. 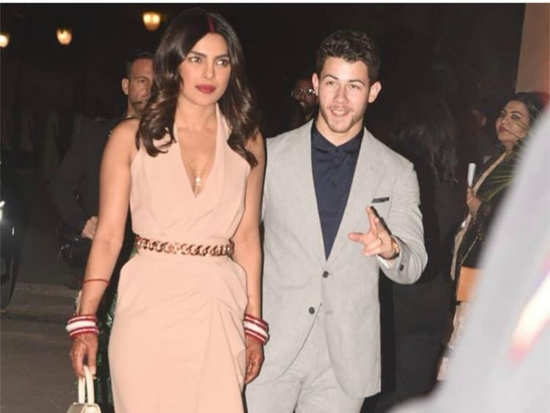 Newly-weds, Priyanka Chopra and Nick Jonas were recently spotted at an event in Delhi and what a glam public appearance they made! After three days of marital ceremonies and after their grand Delhi reception, we have now spotted the power couple make their first ‘official’ public appearance as husband and wife. For the event, Priyanka opted for a peach Ralph & Russo dress featuring a plunging neckline and a slit with ruffle detailing. The monotone dress was accented with a gold chain belt at the waist. One of Priyanka’s mini bags and cream strappy heels rounded off the look. The actress’ look was accessorised with her wedding choodas and with a chain featuring a stunning pendant. Priyanka went with a bold lip look and even with vermillion (associated with love, marriage, and religion) for the night. Her locks were styled in her preferred soft waves. Nick complemented her in a sharp grey suit styled with a black shirt and with dark grey suede shoes. The couple looked so in love as they walked hand in hand and posed for the cameras. 1Priyanka Chopra and Nick Jonas make one stylish public appearance! 6‘Zero's’ Issaqbaazi: Shah Rukh Khan and Salman Khan will make you want to groove along! 7Priyanka Chopra and Nick Jonas are stars of Vogue’s first-ever digital cover! 8‘Simmba trailer’: The Ranveer Singh starrer has blockbuster written all over it! 9Priyanka Chopra and Nick Jonas' mehendi ceremony was better than we ever imagined it would be! 10Priyanka Chopra and Nick Jonas are now man and wife!